If you've driven north on Holiday Hill Road, starting at Briarwood and going to Greentree, you've surely noticed two rather unusual sights on the west side of the road. Both are efforts made by Fasken Oil and Ranch - the landowner - to be a good neighbor to the housing developments across the street. I'm a bit skeptical as to how effective those efforts are, but I give them credit for trying. I'm referring to a temporary sound barrier the company has built around a drilling rig, and another that's situation next to a new office building at Fasken's Vineyard real estate development (I'd provide a link to the development but if there's a website, it's well hidden). Here's the layout in front of the drilling rig. The rig sits a couple hundred yards west of the street, with a large residential development that runs along the east side of the street. To give you a sense of the size of that barrier, a drilling rig of this type is around 100-150 feet tall; I estimate those sound barrier panels are 25-30 feet tall. Drilling is an inherently noisy undertaking. 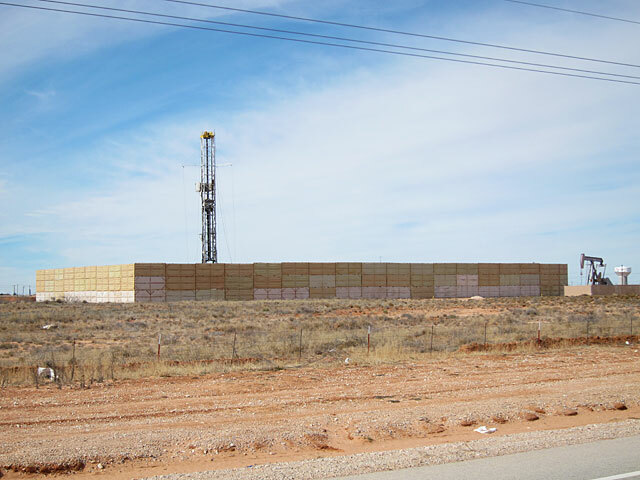 Much of that noise comes from the diesel engines that power the rig, and those engines sit at ground level, so this arrangement may actually be effective in reducing the sound level from the drill site. I've never been outside in the vicinity, except to take these photos, so I can't say for sure. However, from another angle, you can see that the rig isn't exactly nestled within those walls, leaving plenty of space for sound to escape. I suppose this could also be an attempt to prettify the drill site to some extent, although I suspect most Midlanders are pretty jaded to the sight. We certainly don't need to make rigs or production facilities look like condos. Travel north from here a couple of miles and you'll see what looks like a drive-in movie screen running along the road. 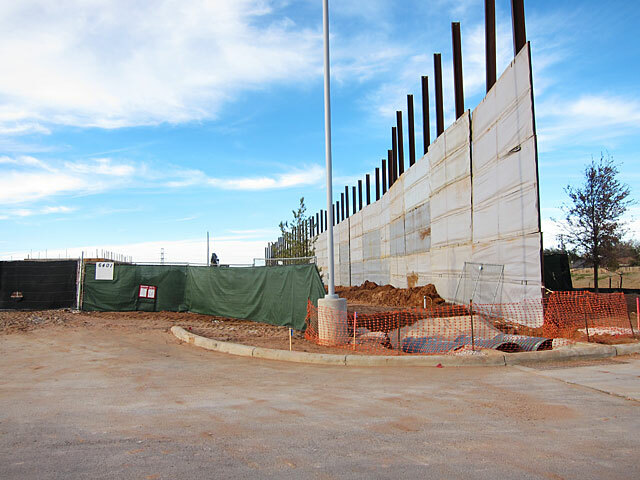 It's another sound barrier at the east end of a new two-story office building that's under construction. Again, this may serve a dual purpose of both noise abatement and visual screening, although I'm not convinced that the barrier is any more pleasant to look at than the building. But it does make an impressive structure. You can't really tell from these photos, but the supporting posts are actually fairly massive steel i-beams, which tells me this was a not-insignificant installation, both in terms of complexity and cost. The drilling rig will likely be moved away within the next couple of weeks (barring any unforeseen complications, of which there are many possibilities...take my word for it), but the building is still months away from being finished. I was curious as to where one might find such industrial strength sound barriers. I don't know where Fasken got theirs, but there's at least one company which specializes in precisely this sort of thing. Updated (1/27/15): I received an email from Tommy Taylor, a long-time Fasken employee, and he provided some clarifications and corrections that are worth noting. First, the oil well is being drilled by Diamondback Energy, not Fasken. I confess I've never seen a well sign so I made a bad assumption about the operator. 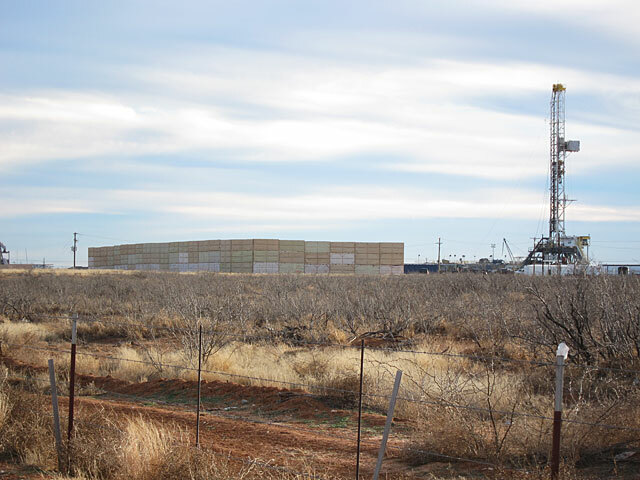 But I now remember seeing other drill sites around Midland with this same kind of enclosure - specifically one on Mockingbird Drive just west of Midkiff - so I think it's standard procedure for Diamondback when drilling close to neighborhoods. The current well isn't in the city limits so it's not a requirement, but it is a considerate move by the company. Second, Tommy said that the sound abatement is more effective than you might think. He said the technique has been used quite often in the Dallas/Fort Worth area where the Barnett Shale wells are drilled right in the middle of neighborhoods. 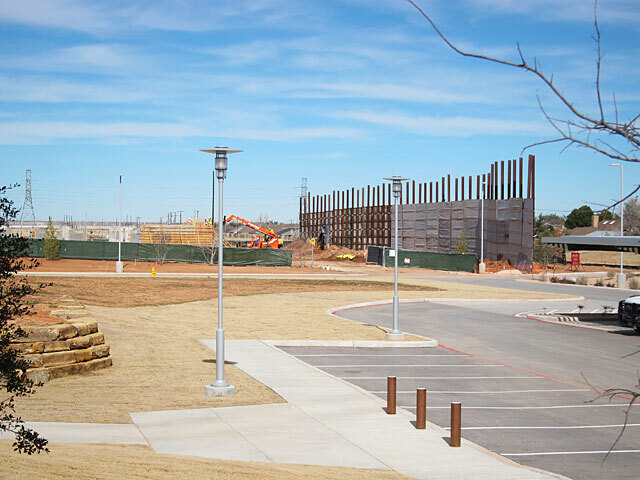 And, finally, he said that the sound walls next to the new building will also serve the purpose of holding down the blowing dirt this spring, something that should have occurred to me, because that's a big deal out here. Also, he said that those i-beams will be leveled off and the panels reversed to that they present a nicer view from the street. This page contains a single entry by Eric published on January 26, 2015 9:41 PM. The Fox Returns was the previous entry in this blog. Random Thursday: The Saturday Edition is the next entry in this blog.